The Pope of Dialogue has thus far slammed the bronze doors of St. Peter’s on any dialogue on the issue of global warming. (Many Catholics argue that everything else is up for dialogue with this Pope, though). Despite his incessant rantings about the need to dialogue, climate change is off limits. In the words of his global warming maestro, Bishop Sanchez Sorondo, climate change is elevated to “magisterium,” deserving of an apostolic exhortation and papal endorsement of the globalists’ precious Paris Climate Treaty. Francis joined the globalist cop-out chorus of the “science is settled.” His global warming architect, Bishop Sorondo scolds the global warming doubters “saying that we need to rely on coal and oil is like saying that the earth is not round. It is an absurdity dictated by the need to make money.” Sorondo also repeats the lame classic globalist slam that the deniers are funded by the oil industry. Wake up, there is simply no dialogue with this Vatican on any issue, not endorsed by the United Nations’ globalists and its bureaucrats. 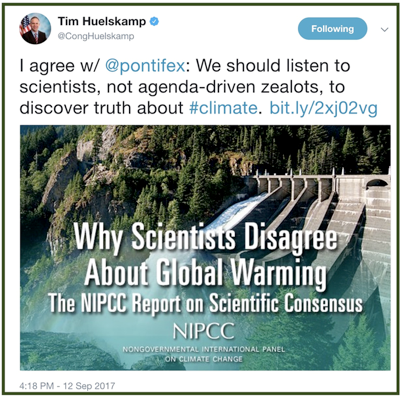 In April 2015, the Heartland Institute, a free-market think tank located in Chicago, which refutes the political agenda of human-caused global warming, sent a delegation of experts to the Vatican to try to present the Pope with the other more scientific view on climate change. As a member of that delegation, I saw first hand and learned that this Pope had no interest in dialoguing about man caused global warming. 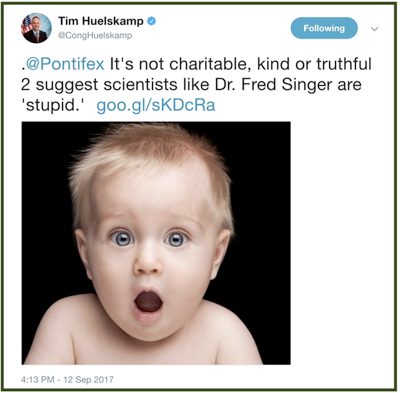 Francis and his Vatican had no time for the highly credentialed Heartland experts, who ranged from NASA scientists who put men on the moon to MIT scientists, climatologists and global climate science experts. Nevertheless, Francis chose not to dialogue. After all, Francis would rather listen to a globalist political hack, like UN Secretary General Ban Ki Moon. 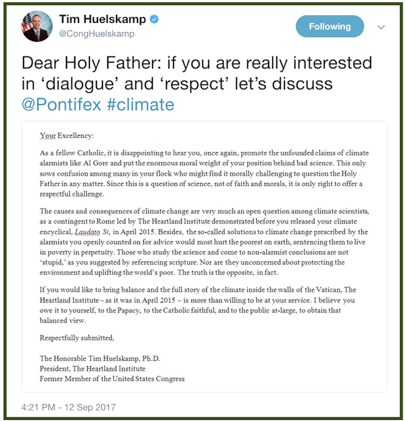 Despite his pontificating about the importance of dialogue, the pontiff’s mind was already decided having listened to population control/global warming proponents, as non scientist Jeffrey Sachs, non scientist Naomi Klein and Hans “the population of the world should be only 1 billion people” Schellnhuber, to name just a few. Creepily, the Vatican dialogue doors were only open to population control greenies. Nevertheless, Francis chose again not to dialogue. A few months later, along came his rambling eco encyclical, Laudato Si, which called Catholics to a new environmental conversion and environmental spiritualism. The 191 page apostolic exhortation included a collective mish-mash of new age sentimentality, polluted with an anti capitalism rant, and faux Ehrlichian predictive catastrophes (LS#24). Francis managed to sink to an all-time theological low by calling for the reduction of air conditioners in a papal encyclical. (LS#55) You just can’t make this stuff up! Since the 2015 Heartland Delegation, the Pope has gone on his merry way issuing his Laudato Si, speaking at the UN in support of the UN Sustainable Development Goals, and the ParisClimate Treaty. 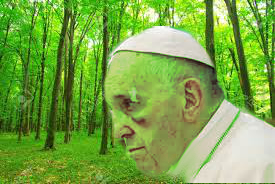 Francis and Barack Obama hugged the same global warming tree and to the Pope’s delight Obama signed the Paris Climate Treaty. Along comes out of the deep blue sky, Donald Trump who doesn’t share the Pope’s view on climate change and nullifies the Paris Climate Change Treaty obligations of the U.S. The Pope is not pleased that his newly fashioned moral doctrine of man caused global warming is not shared by the most powerful man in the world. In fact, Francis seems downright irritated that his best laid plans hatched with the elite Population Control elites at the UN were stymied by this upstart global warming sceptic, Donald Trump. Don’t hold your breath for an answer. Francis will respond to your offer to dialogue, as he did to the Dubia with utter silence and disdain.